Situated little more than a hundred kilometres from Melbourne, Ballarat makes the perfect place to escape the big smoke for a couple of days. Sturt Street, which passes through the very heart of this scenic gold rush city, is among Australia's most striking thoroughfares. An astonishing 60 metres wide, it is lined on both sides with impressive – even ostentatious – heritage architecture. One strolls it not so much in contemplation as in awe. Another notable feature of Ballarat is just how many Southern Cross flags it possesses. There could be no more pertinent example than the one flying proudly outside the Eureka Centre, a museum built on the site of the very event it commemorates – the Battle of the Eureka Stockade. 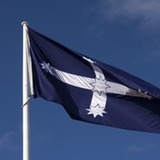 The original Eureka Flag can be found in the Art Gallery of Ballarat. This tattered standard, before which so many aggrieved diggers vowed to "fight to defend our rights and liberties", occupies pride of place. Measuring 260 x 370.5 centimetres, it may have lost some of its lustre, but visitors will discover that it has lost none of its glory. The sense of history is palpable, for this is the last surviving witness to the uprising of 1854. To get a sense of the city's captivating history, a couple of walks – Walking Ballarat's Heritage and the Eureka Trail – and drives – Driving Ballarat and the Ballarat Gold Trail – have been created. The Gold Museum explores the history in greater detail, while Sovereign Hill brings it to life. Brilliant Ballarat boasts quite a few other attractions, including Lake Wendouree, the botanical gardens and the ex-POW's Memorial, all of which are in proximity to one another. For further information, don't forget to stop at the Visitor Information Centre when you arrive. To check out what events are on, click here. And to book accommodation, click here.